“Pariah: Anton” is our next upcoming game. It is going to be a combination of tower defense game and a 2D sidescroller set in an apocalyptic cyberpunk world. The game will have a background story with as little text as possible (Yeah… I’m a fan of Hyper Light Drifter and Kingdom). Player’s main mission will be to gather chips, upgrade his base, craft robots, assign them roles, upgrade them, destroy the spawns of hostile creatures (zombies, monsters and probably other god forsaken creatures.) and escape from planet. The game won’t focus as much on player’s main character as on building base and crafting robots. The crafting system will be as simple as possible, but still enjoyable. Each playthrough will be different because the map is always going to be randomly generated. We are aiming to release the game on a PC in September and when the time is going to be right, we’re gonna try our best to greenlight the game on a Steam market. In the last couple of weeks I’ve been thinking about the architecture of the whole game, the player’s movement, which events will be tracked, AI for robots, zombies, monsters etc.. I still don’t have a lot to show you, but till now, I’ve imported a simple sprite (from the asset store) which represents the player (no complicated animations or any other fancy stuff because the main character is still in the drawing board), I’ve imported a sun and a moon drawn by Žiga. The ground is currently decorated with a tileset which will not be used in the final game – we’re aiming for cyberpunk style palette and a little bit simpler shapes. 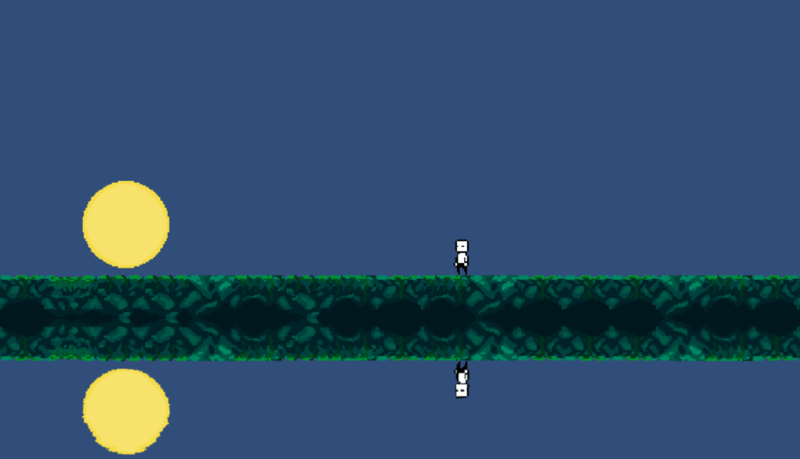 Because the game mainly focuses on the AI of robots and Enemies, the player controls are going to be quite simple. Player is going to be able to walk, dash and use an action button. In video you can see player walking, dashing and dropping chips (without animations :D). Night will stand for terror and will spawn waves of monsters. Day will serve for exploration. I’ll have to figure out which length of day and night will fit the game tempo. We really don’t want player to get bored. That’s why I’m thinking about adding special events which can occur anytime and will lure player to explore the unknown. World’s will be made out of different “biomes”. Currently we have plan to create biomes for: Base, Grassfield, Forest, Junkyard, Factory. Base will always spawn in the middle of the world and will server as a starting point for our player. Player will be able to expand his base to other biomes. I’ll write more about biomes in the future devlogs. For now I have developed a world generation system which semi-randomly chooses and position biomes in the game. If you want to stay updated about our progress, subscribe to our newsletter or social networks.